Major improvements to I-395, including a new signature bridge, are funded for 2018 and preliminary design work continues with an eye toward a January 2015 design completion date, according to the Florida Department of Transportation. In addition, designers and engineers with the state transportation department have narrowed design options for the bridge from four to two alternatives: Lotus and Wishbone. Twenty years in the making, Miami city leaders had to fight to get the I-395 project back on track. City commissioners in July announced an agreement with the state for reconstruction of Interstate 395 that calls for a new “signature” bridge near the Adrienne Arsht Center for the Performing Arts. The project has an estimated construction cost of $500 million to $600 million, in present day dollars, depending on selected structural design. The reconstruction involves some 1.4 miles of roadway. The project goes far beyond construction of a new bridge, with a goal of opening up the vistas near the arts center and Museum Park. Maps show the roadway improvements occurring in three zones or segments, from where it joins I-95 on the west and the start of the MacArthur Causeway over Biscayne Bay on the east. Building new elevated ramps (one eastbound, one westbound) that will directly link I-95 and I-395. Improving roadway design, including updating the alignment and upgrading the roadway surface. Creating a visually appealing bridge. Building taller structures that will improve the visual quality of the bridge. Safety and increased capacity are part of the need for the project, state and local officials agree. The transportation department said project objectives include increased capacity to prevent existing and future traffic congestion and to improve safety by alleviating existing deficiencies. Design goals include opening and brightening the environments along city streets that run under the expressway like Biscayne Boulevard, Northwest 13th Street, 14th Street, Northeast First Avenue, North Miami Avenue and others. Critics of the current low and dense overpass connecting the I-395 lanes to the MacArthur Causeway are plentiful. They argue that the freeway splits the city and that patrons of the arts center at 1300 Biscayne Blvd. are often afraid or intimidated by the low overpass and discouraged to venture southward to the developing area that contains the new waterfront art museum and the city’s new Museum Park. Earlier this year the transportation department’s Aesthetic Steering Committee reviewed preliminary plans and renderings showing lighted and landscaped areas beneath an improved I-395, with new wide walkways and bike paths. It is hoped the new bridge won’t shadow the arts center and divide the downtown from Omni, Edgewater and beyond. The freeway to be rebuilt is part of State Road 836 (SR 836), locally known as the Dolphin Expressway. The portion between I-95 and the causeway is designated as I-395 and takes traffic to and from Watson Island and Miami Beach. The redesign of I-395 and the bridge have been planned since 1992, but the project was halted in 1994 by the Clinton Administration. Ten years later it seemed back on track, only to fade away again. 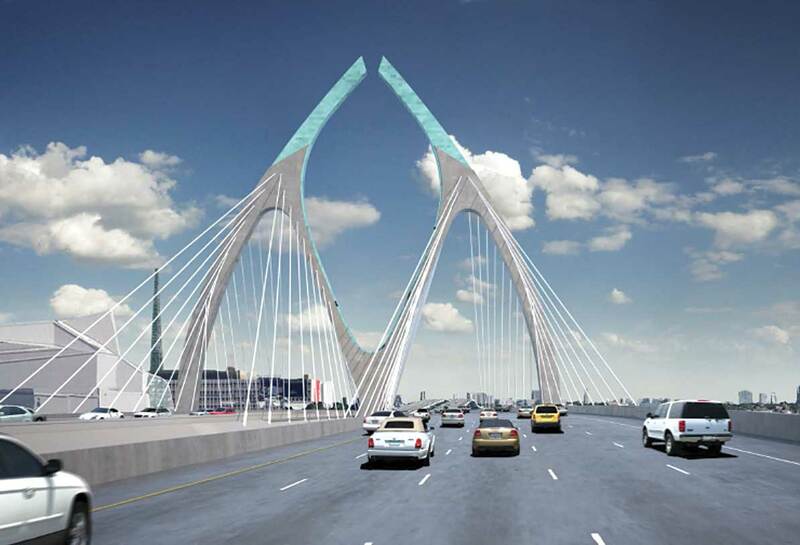 In April 2013, Miami Mayor Tomás Regalado and Commissioner Marc Sarnoff filed a lawsuit against the transportation department accusing the state of not following through on a promise to build “a transformative signature bridge” as part of I-395 improvements. Funding this bridge is a huge waste of money, it should be spent on a rail line to the Beach. The Arsht Center has always fought against any structure blocking the view of the bay and downtown. Because of its powerful political connections, it was able to convince FDOT to annex the land on the north side of I-395 that abutted its parking lots. That land had been previously bought on spec by Avra Jain, a NYC real estate developer who had come to Miami to buy up primo downtown acreage at prices well below anything of comparable value in Manhattan. She was going to build a high-rise there until the FDOT gave her an offer she couldn’t refuse, you know the kind, the one that comes under “imminent domain” and the excuse they would need that land for I-395 expansion. Now it appears whatever bridge design is chosen will block the Arsht Center view of downtown and the bay (something you can only see if you step out onto one of its south-facing postage stamp balconies since aside from the Opera center, the structures are basically windowless)– even more so than what is there now. At one time the FDOT considered removing the bridge and replacing it with an open channel that ran below Biscayne Blvd. That idea would have really opened up the view and was the least expensive solution. It wasn’t perfect (a tunnel would be perfect with expansion of Bicentennial Park over it right up to the Arsht Center doorstep) but it was something doable on a budget. Wonder why it got the kibosh? Make it a tunnel. It will truly add beauty to the city to have all of the area unite. A tall bridge like that will overwhelm the small area it will take up and skew the entire dynamics of the region. A tunnel is best in my opinion. Robert Moses the visoinary of New York deplored tunnels likening them to bathrooms. He wanted everyone to see HIS creations. In this case, I sure would prefer to see a “bathroom”. The proposed new bridge will not fade into the horizon, but rather; just the opposite. A tunnel will join two districts seemlessly and as other readers have pointed out open vistas and create new park land.